Put the white wine, vinegar and shallots into a saucepan and slowly reduce to a syrup. On a light heat slowly add the butter a little at a time until it forms a slightly thick sauce, season with salt and cayenne pepper, add the juice of the half lemon. Strain the sauce into a clean saucepan, in a separate saucepan add two tablespoons of Laverbread with 2 tablespoons of cream, bring to the boil and add half the beurre blanc. Season the fish and coat lightly with olive oil place onto a hot griddle skin side down, until the skin is crisp, place onto an oiled tray and bake in a hot oven 200c for five minutes. While the fish is cooking, in a large pan melt the extra butter and cook the spinach until wilted. 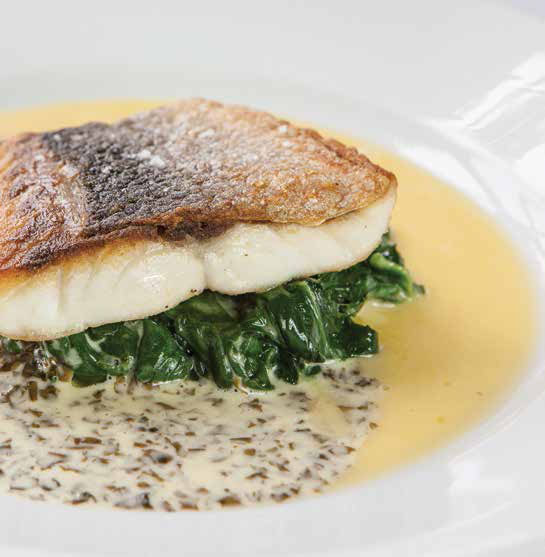 Serve the bass on a bed of spinach and pour the lavabread sauce around one side and the remaining beurre blanc around the other side.